Bear with me, guys, this is gonna be a post about writing. I promised myself I would never go too in-depth with anything too writer-ish in this blog, because I’ll scare all of you away, but I have some quick “writer love” I want to give, and I’m sorry. I started this blog for two reasons: 1) to force myself to write something every week beyond my other duties, and 2) to connect with people. I was told that all writers should give themselves a platform, so that whenever (or if ever) they publish a book, they’ll have more than just their family interested in reading it. So when I finally succumbed to the idea of a blog, I thought, better not make it one of those how-to blogs that only interest the people who have an agenda. The decision was two-fold: not only am I interested in attracting readers who are not writers, but I also am not a professional author… far be it from me to pretend to have the ultimate authority on a subject that I only participate in because I’m a story nerd. I don’t want to tell people how to write, because how I structure a story is not the One True Way to structure a story, and who am I to claim that it is? I don’t even like reading books about writing, because it makes me mad that people are getting paid to tell other people that writing is a formula, some scientific equation that has nothing to do with life and love and inspiration and sheer curiosity. That being said, I’ve been reading a book about writing, and it’s AWESOME. It’s not a how-to book. It’s a book specifically about the writing process for Russel T. Davies, the previous head writer for the TV show, Doctor Who (nerds unite). 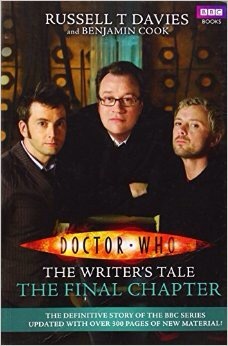 It’s called “Doctor Who: The Writer’s Tale (The Final Chapter)”. This book contains nearly 700 pages of email correspondence between Davies and journalist Benjamin Cook, through which you can see the fourth series of Doctor Who come to life. It’s not a book for everyone… You first have to eliminate those who (criminally) have no interest in Doctor Who, and secondly eliminate those who don’t want to read nearly 700 pages of a man picking through the clutter of his mind to discover his new protagonist’s character arc. But to me, this book is fascinating. I’ve already annoyed my roommates by reading snippets of it aloud — and I’m the one who gets irritated when people do that. Look at what this book has turned me into! What I like about the book is that it reveals the writing process in story form — I have a hard time reading anything that is not a story — and provides such an imaginative (and yet vastly realistic) view of RTD’s relationship with his writing. To him, a character is not just a series of words on paper, or the actor playing the part; to him, the character is a person ready to be written, already there but in need of being revealed; and there is a difference between the character and the actor’s portrayal of the character. This man gets sad when he has to put a character on the backburner, and excited when he’s discovered something about a character that he already knew but didn’t know he knew. He writes the Series Four Breakdown (the episode description list for the writers and production team) like a kid in a candy shop, gleefully pointing at different sweets and throwing them into his basket as he goes. The dreams and wishes of a head writer — or is there any differentiation between the two? It’s reading stuff like this that gets me excited again about writing. Because, let’s face it, lately I’ve been in a kind of mellow place when it comes to writing… I get too in-my-head about plot points, or how readers will perceive something, that I forget what it’s really about: telling a story. Telling a story because it’s there and you want people to know it; because you want others to meet the people who have been walking around in your head; because you have something to say, and it just happens to align with what a character has to do. I miss feeling like a kid as I write, throwing sweets in my basket because they look delicious, and why not try them out? I’m only about 70 pages in, so I can’t say that the rest of the book will capture my attention like it has… but so far it’s been a joy. I can only hope that it will stir in me a desire to write more than the bare necessities every week. I want to write because it’s an addiction, not a requirement.